The first king from the House of Holstein-Gottorp, Adolf Frederick was a weak monarch, instated as first in line of the throne following the parliamentary government's failure to reconquer the Baltic provinces in 1741–43. Aside from a few attempts, supported by pro-absolutist factions among the nobility, to reclaim the absolute monarchy held by previous monarchs, he remained a mere constitutional figurehead until his death. His reign saw an extended period of internal peace, although the finances stagnated following failed mercantilist doctrines pursued by the Hat administration. The Hat administration ended only in the 1765–66 parliament, where the Cap opposition overtook the government and enacted reforms towards greater economic liberalism as well as a Freedom of Press Act almost unique at the time for its curtailing of all censorship, retaining punitive measures only for libeling the monarch or the Church of Sweden. From both his parents he was descended from Holstein-Gottorp, a house with a number of medieval Scandinavian royal dynasties among its ancestors. 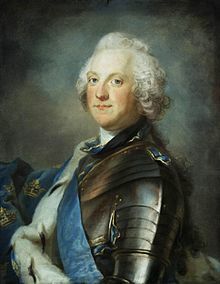 Adolf Frederick was also a 13th-generation descendant of King Erik V of Denmark; a 13th-generation descendant of Sophia of Denmark and King Valdemar I of Sweden; and an 11th-generation descendant of Euphemia of Sweden, Duchess of Mecklenburg and her husband the Duke Albrecht. From 1727 to 1750 prince Adolf Frederick was prince-bishop of Lübeck, which meant the rulership of a fief around and including Eutin. After his first cousin Charles Frederick, Duke of Holstein-Gottorp died in 1739, Adolf Frederick became administrator of Holstein-Kiel during the minority of the duke's orphan son, then known as Charles Peter Ulrich. Shortly afterwards, the young boy was invited to Russia by his maternal aunt, Empress Elizabeth, who soon declared him her heir; he later became known as Peter III of Russia. In 1743, Adolf Frederick was elected heir to the throne of Sweden by the Hat faction (Swedish: Hattarna) in order that they might obtain better conditions at the Treaty of Abo from Empress Elizabeth of Russia, who had adopted his nephew as her heir. He succeeded as King Adolf Frederick twelve years later on 25 March 1751. During his twenty-year reign, Adolf Frederick was little more than a figurehead, the real power being lodged in the hands of the Riksdag of the Estates, often distracted by party strife. Twice he endeavoured to free himself from the tutelage of the estates. The first occasion was in 1756 when, stimulated by his imperious consort Louisa Ulrika of Prussia (sister of Frederick the Great), he tried to regain a portion of the attenuated prerogative through the Coup of 1756 to abolish the rule of the Riksdag of the Estates and reinstate absolute monarchy in Sweden. He nearly lost his throne in consequence. On the second occasion during the December Crisis (1768), under the guidance of his eldest son, the crown prince Gustav, afterwards Gustav III of Sweden, he succeeded in overthrowing the "Cap" (Swedish: Mössorna) senate, but was unable to make any use of his victory. Adolf Frederick died in Stockholm on 12 February 1771 after having consumed a meal consisting of lobster, caviar, sauerkraut, kippers and champagne, which was topped off with 14 servings of his favourite dessert: hetvägg made of semla and served in a bowl of hot milk . The king was regarded, both during his time and in later times, as dependent on others, a weak ruler and lacking of any talents. But he was allegedly also a good husband, a caring father, and a gentle master to his servants. His favourite pastime was to make snuffboxes, which he allegedly spent a great deal of time doing. His personal hospitality and friendliness were witnessed by many who deeply mourned him at his death. Following his death, his son Gustav III seized power in 1772 in a military coup d'état, reinstating absolute rule. Adolf Frederick may have been the father of Lolotte Forssberg by Ulla von Liewen, but this has however never been confirmed. ^ L. Stavenow. "Adolf Fredrik". Svenskt biografiskt lexikon. Retrieved January 1, 2019. ^ "Christian August (Herzog von Holstein-Gottorf)". Allgemeine Deutsche Biographie. Retrieved January 1, 2019. ^ "Adolf Fredrik". Nordisk familjebok. Retrieved January 1, 2019. R. Nisbet Bain, Gustavus III. and his Contemporaries, vol. i. (London, 1895). ^ Nina Ringbom. "Kristina Magdalena av Pfalz-Zweibrücken". historiesajten.se. Retrieved January 1, 2019. ^ "Holstein-Gottorp". europeanheraldry.org. Retrieved January 1, 2019. ^ "Peter III". Saint-Petersburg.Com. Retrieved January 1, 2019. ^ "Hattpartiet, Hattarna". Nordisk familjebok. Retrieved January 1, 2019. ^ "Mösspartiet, Mössorna". Nordisk familjebok. Retrieved January 1, 2019. ^ Magnus Carlstedt. "Hetvägg". semlor.nu. Retrieved January 1, 2019. ^ "Gustav III (January 24, 1746 – March 29, 1792)". European Royal History. Retrieved January 1, 2019. ^ Genealogie ascendante jusqu'au quatrieme degre inclusivement de tous les Rois et Princes de maisons souveraines de l'Europe actuellement vivans [Genealogy up to the fourth degree inclusive of all the Kings and Princes of sovereign houses of Europe currently living] (in French). Bourdeaux: Frederic Guillaume Birnstiel. 1768. p. 28. Wikimedia Commons has media related to Adolf Frederick of Sweden.